Enjoy getting away from it all to your own private haven. The house itself is on two levels with all rooms enjoying stunning views that stretch from Paihia to Russell, taking in both the sunrise and the sunset! The large lounge, kitchen, dining area plus a guest powder room provide the perfect entertaining space. There are three large bedrooms that each have a full ensuite and outside deck access. Stroll through the gardens to the beach track that provides easy access to a beautiful and private swimming beach. There is also ample parking and even room for the boat! Due to the layout of the property it is not suitable for Children under the age of 13. Guests may be refused entry to the property if this rule is not adhered to and additional cleaning charges may apply if it is found. The houses property manager reserves the right to request a refundable damages deposit should they have any concerns with the nature of a guests booking. Stunning view, spectacular house which has been recently updated, esp the master suite & kitchen. Quiet location a short car ferry ride from Paihia. Lots to do & see, but the property is so great it’s hard to leave. A landscaped path winds down to a private beach below the house which gets wide at low tide. Furnishings are comfortable. Bring your cameras. This was an exceptional holiday destination. The house was immaculate and it was like visiting our own home. The views are spectacular. Set in beautiful gardens with an unsurpassed view over the bay. Property is well appointed and comfortable. Thank you to Kelly for providing excellent advice during our stay. Stunning house with an awesome view- good equipped with a huge kitchen. We only missed 2 comfortable sunbeds - nothing else. Outstanding location, condition and breath taking views. Well equipped, only thing missing were some good sunbathing loungers. This property is amazing and the views from every room are sensational! This property is amazing and the views from every room are sensational! It has a wonderful open plan living area with glass entirely on one slide to allow you to take in the views. We were a group of 5 adults (two couples and one single) and none of us wanted to leave after staying in the house for a week. This has to be one of the best properties we've ever rented and have travelled extensively over the last 25 years. Absolutely gorgeous house with an amazing view of the bay between Russell and Paihia. 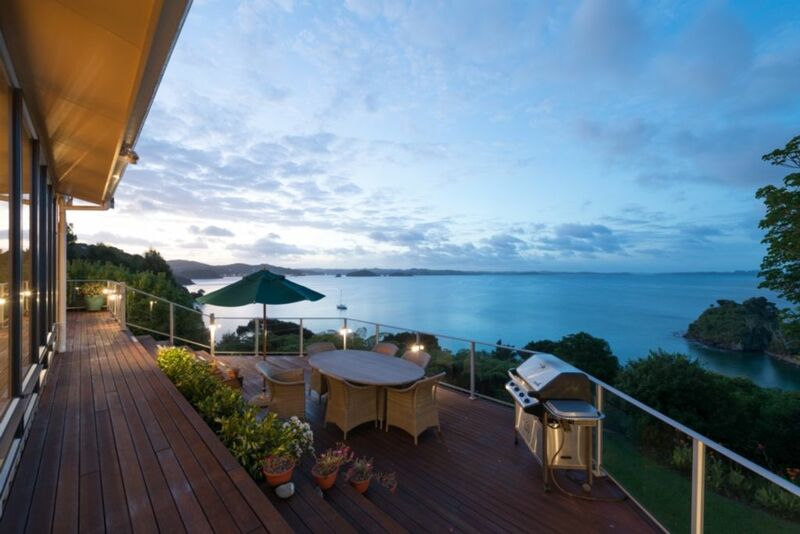 Absolutely gorgeous house with an amazing view of the bay between Russell and Paihia. Secluded location away from the hordes of tourists in town. Short drive back to Russell. Well appointed and designed house with beautiful landscaped grounds as well as a private beach. Sad to leave - best part of our vacation in New Zealand!